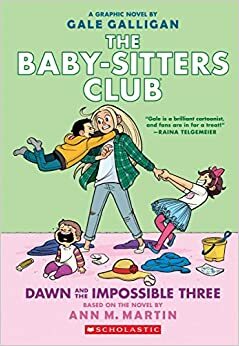 Summary: Dawn, the newest member of the Baby-Sitters Club, has her hands full with a new job, friendship issues, and family changes. She takes a job babysitting the Barrett kids, and gets more than she bargained for when their frazzled single mom gives her increasingly inappropriate responsibilities. Everything comes to a head when Buddy Barrett goes missing, and Dawn must confront Mrs. Barrett about her irresponsible behavior. Meanwhile, Dawn’s mom and Mary Anne’s dad are getting more serious about their relationship, making the two girls excited at the prospect of becoming sisters, but leaving Kristy feeling left out of the loop. There’s also a subplot about Mallory Pike, a junior babysitter just starting out with the club, and the older girls’ doubts about whether or not she’s fit for the job. All is resolved, and the final photo shows the six girls, smiling for the camera with their arms around each other. 160 pages; grades 3-6. Pros: Fans of the first four graphic novels by Raina Telgemeier will not be disappointed by newcomer Gale Galligan’s interpretation of book #5 from the original Ann M. Martin BSC series. The artwork is similar, but not identical, which takes a little getting used to, but the story has plenty of heart, friendship, and babysitting action. I always wondered why Scholastic didn’t continue with what must have been a cash cow after book #4 was published a few years back. I’m happy to have at least one more, and hope they’ll continue. Cons: In the Ann M. Martin series, the Mallory events were given their own separate book, which I think would have been a better choice for this series as well. Thanks – I need more Graphic Novels in my library. The Mallory subplot didn’t fit into this book – at the beginning, Dawn is babysitting Mallory and some of her siblings. If Mallory is now a babysitter (she says she looked after her siblings when Nicky broke his finger) why is Dawn babysitting her? It seems like the Mallory subplot was rushed; there was no real “test” like they had in the novel; they should have introduced Jessica too. I think that the book would have worked out much better if they stuck to the subplot in the original novel Dawn and the Impossible Three and then made another graphic novel, this time it would be Hello, Mallory – that way they could cover the entire plot and introduce one of the other main characters too – Jessica Ramsey. I couldn’t agree with you more! Mallory deserves her own book, and it’s time to introduce Jessi! They’re releasing a new Graphic Novel, called “Kristy’s Big Day”. It’s due August 28, 2018. Since Mallory wasn’t a main part of any of the original novels until “Hello, Mallory”, and I know she wasn’t a part of the original novel, “Kristy’s Big Day”; how will they incorporate her into this one? Will she ever have her own book? Will they ever introduce Jessica Ramsey? I feel like they screwed up when they wrote the Graphic Novel “Dawn And The Impossible Three” because of the Mallory Subplot. I wonder if the subplot for “Kristy’s Big Day” will be poorly done as well.